View More In Screen Houses & Rooms. 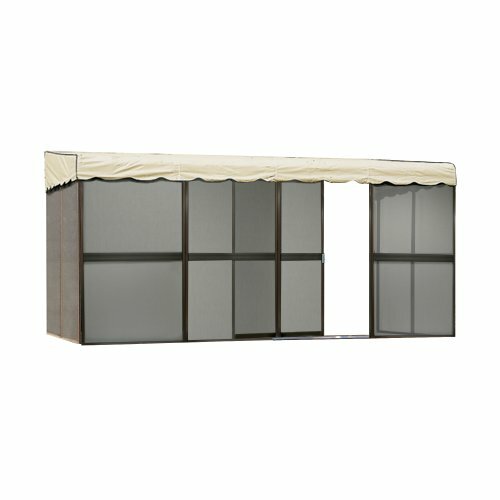 This easy-to-construct Brown Patio-Mate screen room enclosure from Kay Home is ideal for your home, summer cottage, mobile home or RV. Add 119 sq ft of three season living space to your wooden deck, concrete patio or mobile home. Rustproof fiberglass screens allow air to circulate while keeping out flies, mosquitoes and other annoying insects. Features 1 sliding doors which can be positioned anywhere allowing you to pick the most accessible location. Grommets in the Almond color roof help prevent water pocketing and sagging while the rustproof fiberglass screens allow air to circulate while preventing the entry of pesky insects. Top to bottom screens give maximum sun and bug protection. Features 1 sliding door which can be positioned anywhere allowing you to pick the most accessible location. Rectangular screen house consists of 8 panels each– 45-inch wide by 75-inch high. Fully Assembled: 7-feet 8-inch Deep by 15-feet 5-inch Wide by 7-feet 4-inch High and variable height shed style roof min 7-feet 4-inch – max 8-feet 1-inch. Peak height at house is adjustable in 1-inch increments. The support bar, at the halfway point, on the inside of the screen panels provides panel stability, snap-on threshold stabilizes door frame. Heavy-duty galvanized cold rolled steel frame with baked-on architectural finish to resist fading and oxidation. Remove the roof in the off-season as this screen room is not designed to support a snow load. Do not hang objects from rafters. Roof is detachable for easy maintenance, storm removal and winter storage. Rain gutters are recommended on the house above this screen room to prevent damage from excessive water accumulation. If severe winds or storms are forecasted, removal of the roof is recommended. Assembly required. Instruction manual allows for an easy two person installation. Add 119 sq ft 3 season living space to your wooden deck, concrete patio or mobile home. Heavy-duty galvanized cold rolled steel frame with baked-on architectural finish resists fading and oxidation. Fiberglass screening is rustproof 18 x 16 memory mesh - Lets the breeze in while keeping insects out. 1 sliding door can be positioned anywhere allowing you to pick the most accessible location. If you have any questions about this product by PatioMate, contact us by completing and submitting the form below. If you are looking for a specif part number, please include it with your message.